Arguing with people is never a nice experience. But even more so when it’s a parent. I don’t really like arguing, simply because it stresses me out, and when I get stressed my face acts up. Seeing that I changed my blog provider, you wonderful people won’t know what I’m talking about so I’ll give you a quick low down. Basically around the summer of 2013 I had Bell’s Palsy, which meant half my face stopped working. Fun fun fun. So I have to talk things in my stride but that doesn’t always go in my favour – at 1am, I snuck back into (yes back into) my house. I shan’t explain everything that happened but I haven’t slept at all and my mind is clouded 😦 . 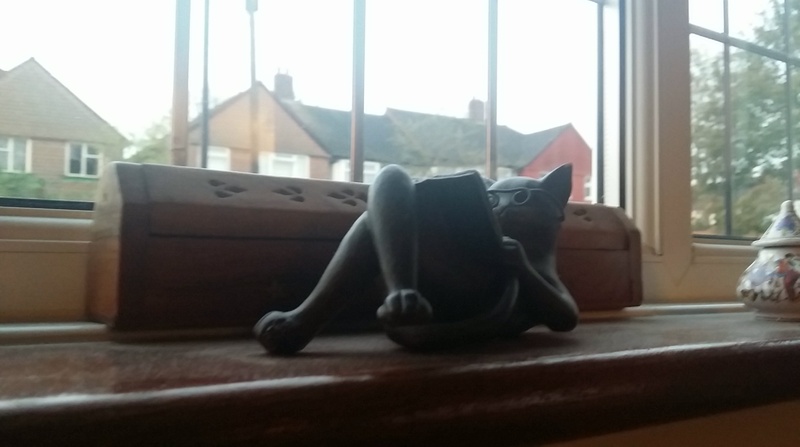 Thoughtful kitty statuette on my windowsill. More thoughtful than me. Dang, hope you’re feeling a little better now.